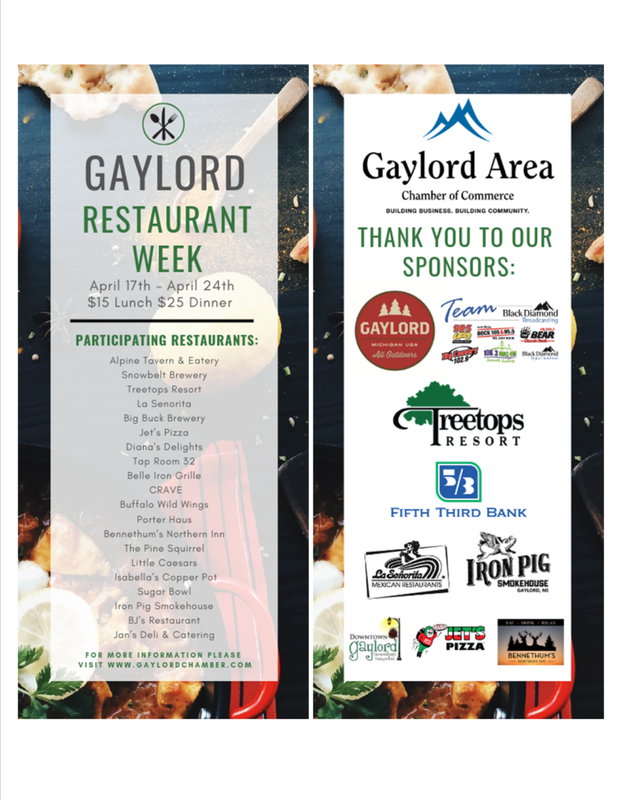 Restaurant Week in the Gaylord Area. April 17th - April 24th, 2019! Restaurants: Alpine Tavern and Eatery, Snowbelt Brewery, Treetops Resort, La Senorita, Big Buck Brewery, Jet's Pizza, Diana's Delights, Tap Room 32, Belle Iron Grille, CRAVE, Buffalo Wild Wings, Porter Haus, Bennethum's Northern Inn, The Pine Squirrel, Little Caesars, Isabella's Copper Pot, Sugar Bowl, Iron Pig Smokehouse, BJ's Restaurant, Jan's Deli and Catering.